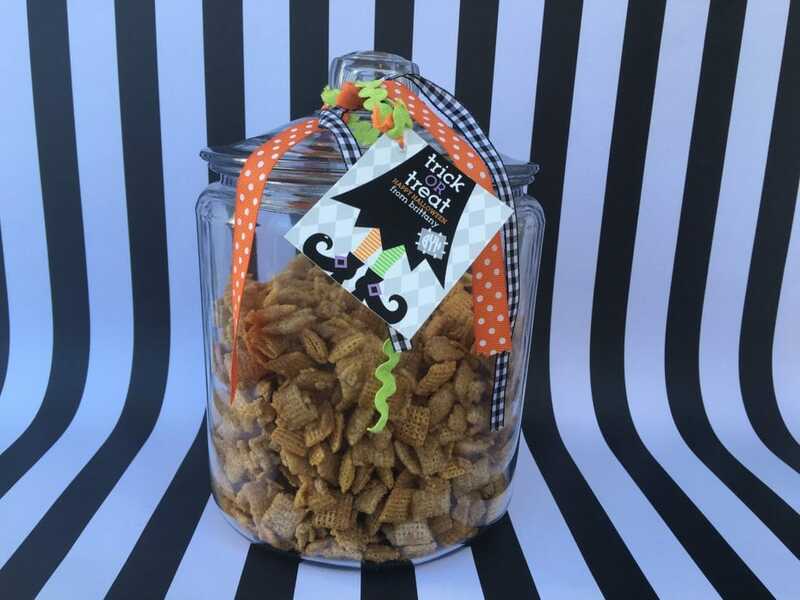 This crisp crunch mix is perfect not only for snacking while cuddling on the couch watching Hocus Pocus for the 4th time (but who’s keeping count?!) It also makes for a fantastic (yet frugal!) tasty gift at only $13 a pop! In a heavy sauce pan over medium heat, melt butter, brown sugar, and corn syrup until mixture comes to a boil. Stir consistently and let boil for 1 minute. Mix cereal in a large mixing bowl. Mix white sugar and cinnamon in a small zip lock bag. Pour hot mixture over cereal and coat evenly. 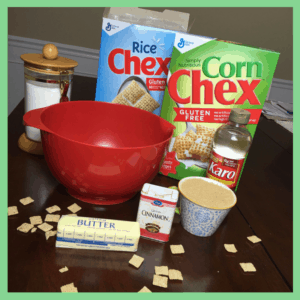 Pour cinnamon sugar over cereal and mix. Spend cereal on covered backing sheet. Bake for 5 minutes, then flip the cereal and bake for another 3 minutes or until cereal turns golden brown. Remove from the oven and let completely cool. Once cool store in an airtight container or a fun Apothecary jar like me! I am totally OBSESSED with these adorable apothecary jars this season! Check out my Snicker Salad Sensation below to see another SWEET take on apothecary jar recipes! Snicker salad…say what ?!? Join me! !